No better day for a protest: hassled photographers flood into Downtown Silver Spring. For more pictures, check out our slideshow - and this extensive pool of protest photos. Additional coverage at the Silver Spring Penguin and the Silver Spring Scene. 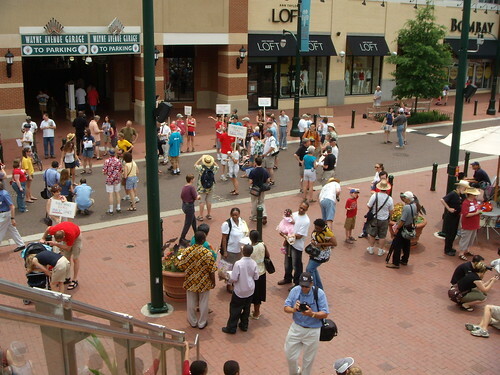 While most Americans celebrated the Fourth of July with a leisurely bar-be-que, Silver Spring residents took to the streets. Yesterday afternoon, over one hundred photographers stormed Ellsworth Drive to demand free speech in a place where it should be most welcome: Downtown. "The sign behind me says 'road closed,'" said organizer Wayan Vota, standing on a soapbox before the crowd of photographers on "the Turf." "We can think of it as saying 'rights closed.'" The "Silver Spring Photo Walk," as dubbed by organizers Free Our Streets, was in protest of the Peterson Companies' disrespect towards local bloggers and photographers in their wildly popular Downtown Silver Spring complex after photographer Chip Py was accosted by security for taking pictures on Ellsworth last month. It was a quite a rebuttal to the Peterson Companies, who attempted to derail the protest with a compromise earlier this week and a photo contest to take place the same day. AFTER THE JUMP: What residents, State Sen. Jamie Raskin and former news anchor I.J. Hudson have to say. 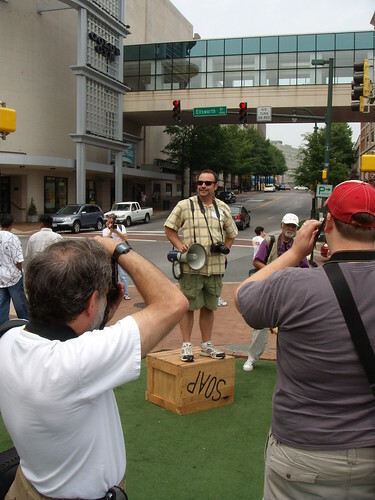 Photographers gather in Silver Plaza during the Silver Spring Photo Walk. "The thing that ticks me off is . . . my taxpayer dollars go to supporting the security," says Tricia Southard, University of Maryland student and member of the Flickr group DC Photo Rights. "Granted, Peterson has given way . . . but they can yoink that at any time." Mauro Giacchetti, local resident and friend of Py, stressed the importance of protecting personal rights. "It's a worthwhile thing," says Giacchetti. "We don't really want people's rights taken away. 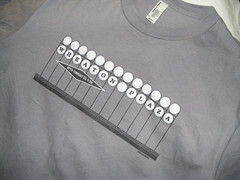 They seem minimal, but they're the only ones we have." Despite their frustration towards Peterson, the protesters were peaceful, taking to Ellsworth as if was any normal day in Silver Spring. 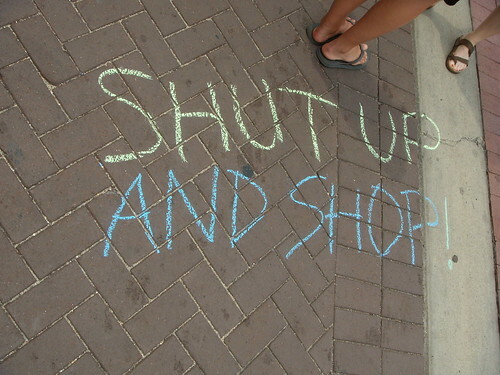 As stern-faced security guards watched helpless, number of people (including myself) took chalk and wrote on the brick-paved streets slogans such as "Shut Up And Shop!" and "I'll Buy My Rights For $2.00," referring to the Peterson Companies' lease of Ellsworth Drive from Montgomery County for one dollar a year. That arrangement, in which the County leased Ellsworth to Peterson in exchange for the right to develop and manage the Downtown Silver Spring complex, is one example of a public-private partnership. Combined with the project's open, public design, free speech becomes a given, says State Senator Jamie Raskin (D-20). "We're just establishing that public space belongs to the people," says Raskin, who rushed to the event from a 4th of July parade in Takoma Park and was the only politician to show today. "The streets, the sidewalks, the parks belong to the people for what they will." "The first amendment gives the right [to take photos]," he continues. "You can't turn the whole county into Disney World, and it's not even clear if Disney World can take your rights away." With several other Peterson projects already completed or under way in the region - including its high-profile National Harbor in Prince George's County - something should be done to prevent incidents like this from happening again. "I wanna look at the terms of the contract," says Raskin. "We may need a state law that says that public land may only be taken over if they respect public rights." However, the Peterson Companies feel their new policy, which allows photography on Ellsworth so long as it does not disturb other patrons, already does so. Last week, Forest Glen resident Adam Pagnucco was meeting with Montgomery County police regarding the protest when Peterson representatives barged in. Pagnucco, who's dealt with large corporations in the past defending labor unions, demanded that Peterson give photographers full rights on Ellsworth. "[Pagnucco]'s a very sharp guy, very instructive," says I.J. Hudson, Peterson's lawyer. "Within a day and a half, we'd drafted a policy." Chip Py has soundly rejected Peterson's new proposal, demanding full First Amendment rights to free speech. No sooner had I introduced myself to him did he make that clear: "We are not gonna compromise our civil rights," he said before walking away. Meanwhile, Hudson - best known as a former anchor on Channel 4 - was on Ellsworth today to speak with protesters. "I'm here to make sure people are treated with respect, to make sure our photo policy ensures people are treated with respect," he says. "There never was a 'photo ban' . . . If we see someone with a nice-looking camera, we ask them to check it with the guards . . . We ask that people be respectful and not disruptive." "Public-private partnerships are important to a lot of places," says Hudson. "Sometimes, things don't happen without them. We were charged to manage this property the best way we know how . . . and that's what we're gonna do." "I think we've been good corporate citizens," he continues. "I wouldn't say it if I didn't believe it." 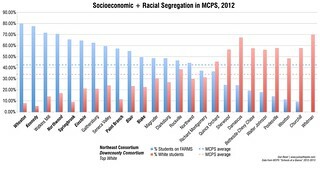 And I'll weigh in on this in a bit too. 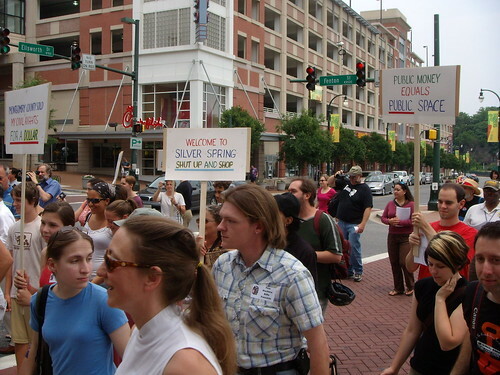 View streaming video of the event onThe Silver Spring Penguin. Dan, you took down my comment, which made me sad, but made the change, which made me happy. Stupid question, but if I have a decent camera with me, what exactly does "check it with the guards" mean? Get a claim check? See if they like my camera? Take a quick photo with them to make sure it works? Good on everyone who was there to protest. I am sorry as heck that I missed this. 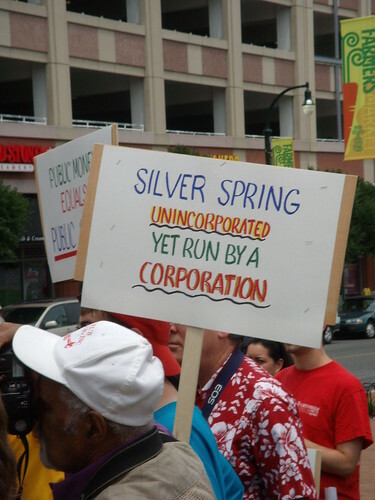 That sign that said something like "Silver Spring, unincorporated but run by a corporation"... that's emblematic of what is wrong here in Montgomery County. You the citizen are being sold to the corporatia by your elected officials. Read your Constitution and demand your rights. It isn't riot if you're in the right and against whom to march is in the wrong.